Nine interactive exhibits, from audio soundscapes to a "gesture wall" and touchscreen exhibits explore this Grade I listed pier, the town and the surrounding area. Clevedon Pier was once described by Sir John Betjeman as “the most beautiful pier in England” and is the country’s only Grade I listed pier. 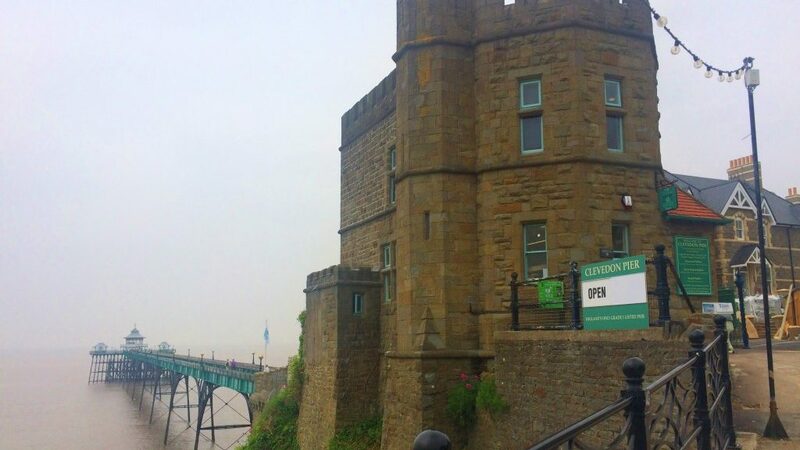 It certainly has a lot of history and the development of a new visitor centre allowed us to work with Querceus Design and The Workhaus to provide an interpretation scheme for the Clevedon Pier and Heritage Trust. 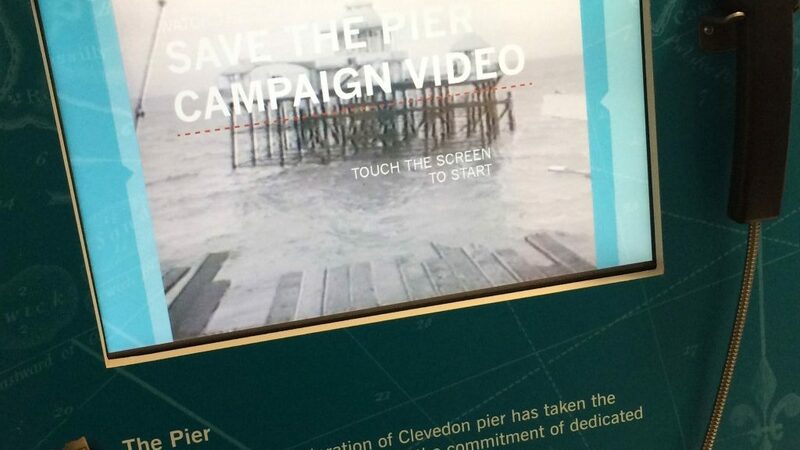 In all, we have worked on nine interactive exhibits with digitised content which explore the history of the pier itself, the history and life of Clevedon, and that of the surrounding area in the Severn Estuary and Bristol Channel. Underpinning the exhibits is our content management system, a flexible, easily updateable system that allows the client to add to and update the content and to choose which elements are displayed by which exhibits. It can be accessed remotely and used offline to test content before it goes live. Triggered by visitors’ movement as they walk up to the exhibition space on the first floor of the visitor centre, this audio soundscape evokes memories of the pier and seaside, following themes of sounds of nature and the local wildlife, people at play with traditional seaside activities such as a Punch and Judy show, and the working life of the pier including sounds of the historic paddle steamer “Waverley”. 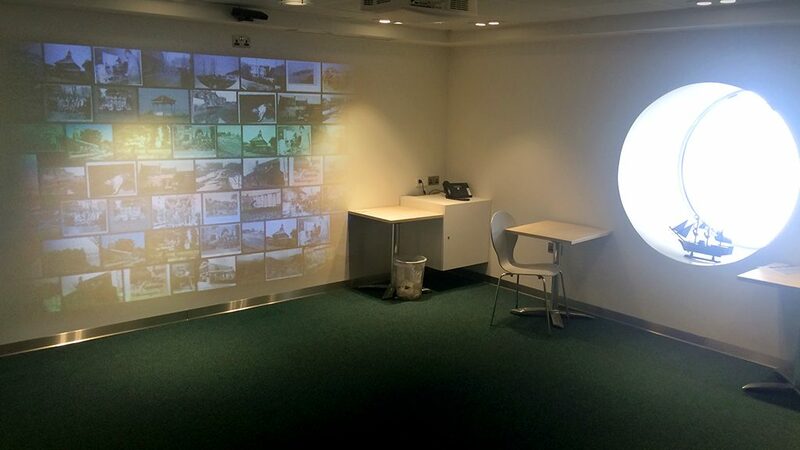 This gesture wall in The Porthole Room provides an immersive, exciting interactive introduction to the visitor centre. Popular with young and old alike, it presents images and videos drawn from the archive material in the content management system, allowing visitors to start their exploration of the history of the pier. 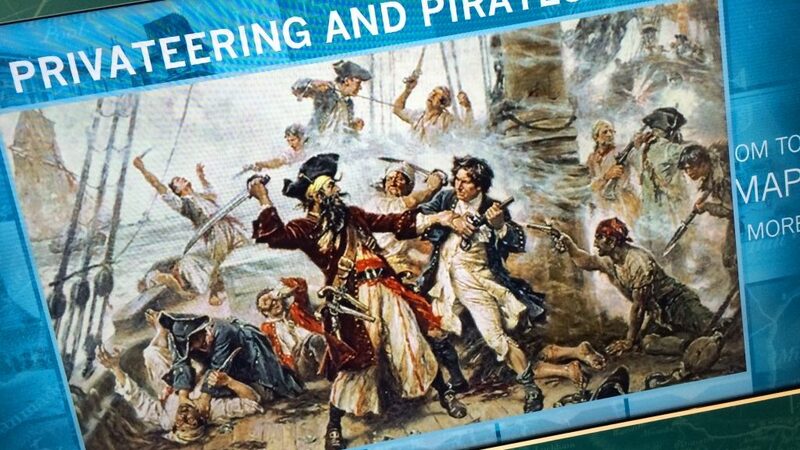 The exhibit is also proving popular for educational purposes as a key attraction for visiting school children and, because the technology can be uncoupled from the content management system to display alternative media from a USB stick, it is an attractive marketing advantage when hiring the venue for events and functions. 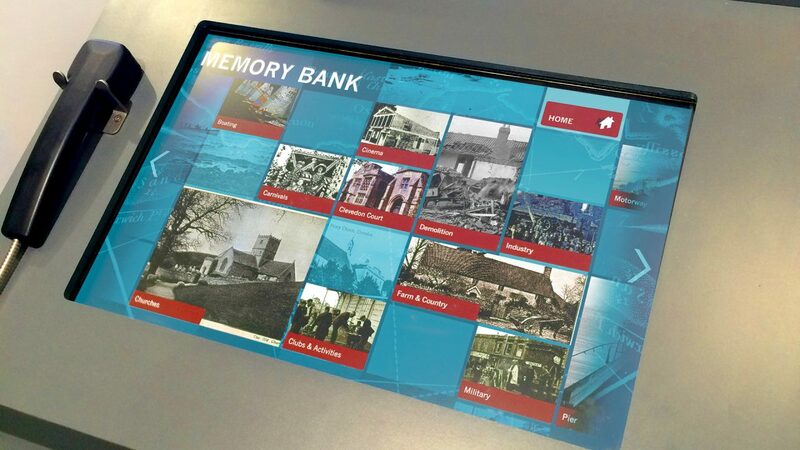 This touchscreen exhibit allows visitors to browse a wide range of media from the Clevedon Pier and Heritage Trust’s archive. A themed menu allows the visitor to explore their own interests, including developing their journey through archive information from those stimulated by the “SeeWall”. 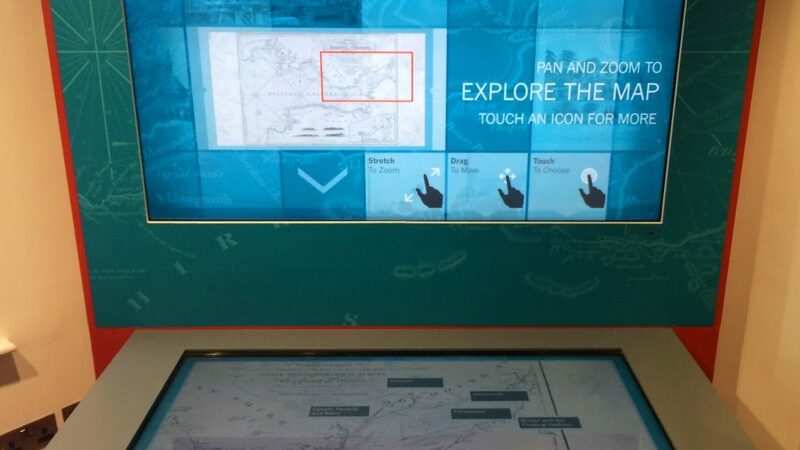 This dual screen interactive uses a 46” multi-touch screen to select and display interpretive content on a second 55” “slave” screen, showing the relationship of Clevedon to the Severn Estuary and Bristol Channel. 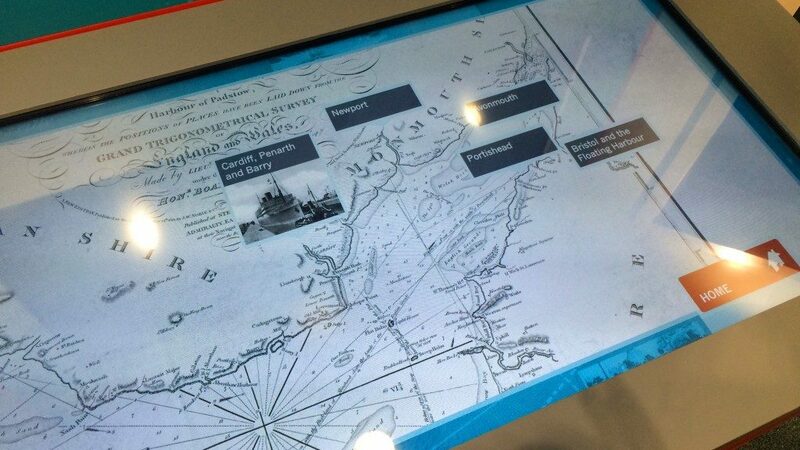 The control screen shows a range of historic maps of the area, which can be examined in glorious detail through pan and zoom gestures, providing interaction with points of interest exploring themes including early trade routes, the slave trade, shipwrecks and pirates, and the era of dock building. 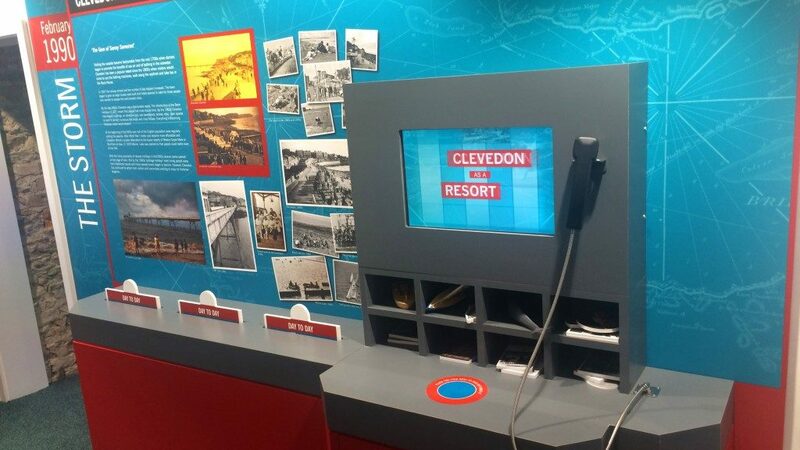 The history of Clevedon as a resort is told through artefacts and images tagged with RFID technology which are placed in front of a touch screen to give access to text, images, video and audio. Particularly goodfor younger visitors, this exhibit is a tactile way for them to explore the archives. 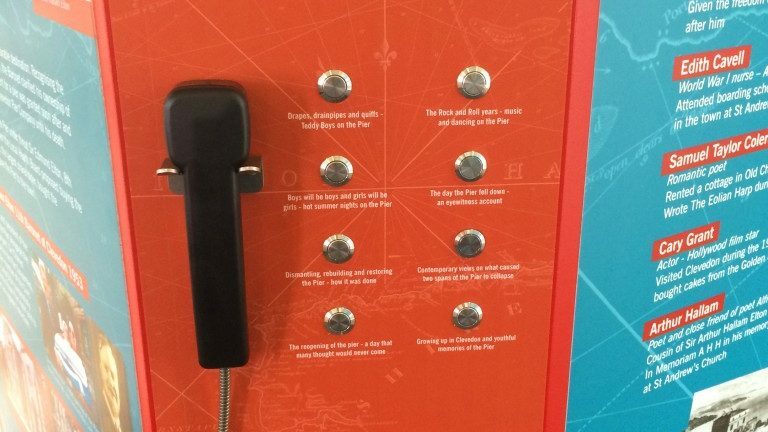 The soundpost plays oral histories of different people through different points of the pier’s history. The visitor can choosefrom different clips of people recalling the times in their youth that they spent on the pier from Clevedon teddy boys dancing there to witnesses to the great storm to those who campaigned for the pier’s restoration and re-opening. 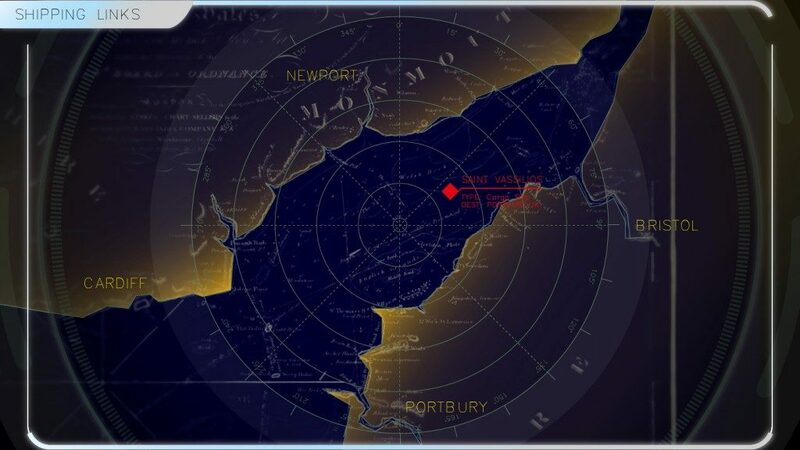 This exciting exhibit uses real-time AIS data broadcast from ships navigating the Bristol Channel to give visitors a live view of shipping activity in the area. The radar-effect interactive allows visitors to click on a ship and find out about it: what type it is, where it is headed, what its cargo is. Associated with this exhibit, Clevedon Pier is hosting an antenna to improve the collection of this data in the Bristol Channel. This audio visual interactive shows a video of edited excerpts from a BBC documentary showing the drama of the collapse of the pier and the effort that local people put into bringing it back to life. It features a time lapse of the pier being rebuilt.